This Mushroom Fairy House Garden Set is a great way to start your very own Fairy Garden and to bring a little bit of magic into your garden. 1 Hand sculpted Mushroom Fairy House. 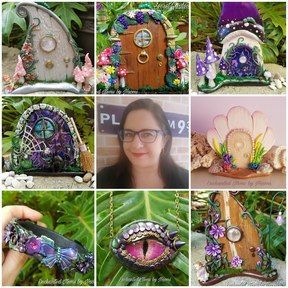 This Mushroom House is a cute little addition to the Garden with it's little details like a topsy turvy roof, a little Fairy door in the base of the mushroom, with blades of grass and a stepping stone. 6 sculpted Flat Pink Daisy flower assorted sizes. Pink fence approx. 11cm long x 3cm tall (not handmade). A baby Fairy approx. 3cm tall.